Wall art has always been a brilliant way of giving personal artistic expression to reflect ones interests, hobbies, everyday life and culture. Wall art’s earliest beginnings can be traced to prehistoric cave paintings. These have been discovered in many parts of the world. 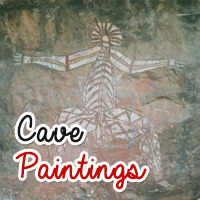 Cave paintings, mostly in animal forms, have been found in the Anjanta caves in India, The Apollo caves in Namibia, Native American rock art in Nevada, Water Mountain paintings in the Sahara, Aboriginal art in Australia and the natives of Norway. However, the most spectacular cave paintings are at Lascaux in southern France and ancient drawings of bison at Altimira in northern Spain. But why did primeval man (or woman) paint these images? Was it a need to be creative, or did these paintings have a religious meaning. Some scholars believe that primitive man went into caves to talk to the gods and the paintings were either a wish list, a sort of symbolic prays, or visions the gods sent them. Another theory is that these paintings could be an early form of personal publicity or boasting. One hunter showing the rest of the tribe or group which animals he had slaughtered. We will never know for sure, but archeologists all agree that cave paintings demonstrate early humans' capacity to give meaning to their surroundings and communicate with others. Why don’t you transfer your personal artistic expression to the walls, in your home (or cave), by shopping online with Brilliant Wall Art, for Metal Wall Art? Do you love animals and the natural world? Do you prefer plants, flowers, trees and woodland? You will find a universal range of Metal Wall Art, ideal for your blank canvas. Check out the metal wall art designs influenced by nature and the world. We have a wonderful, bright, colourful and inspiring range of Abstract or Contemporary Wall Art. There are many different mediums to choose from, including Resin Wall Art, Wooden Wall Art, Glass Wall Art, Rope Wall Art, Canvas Wall Art and of course the popular Metal Wall Art. Brilliant Wall Art offer all customers our Price Promise as we are confident that we will not be beaten on price. If you see the same product advertised at a lower price including delivery and in stock, we will endeavour to match the price and where possible beat it. Simply contact our team with details of the store or Website that you have seen the product(s) at a cheaper price and let us do the rest.